I've read lots of different articles and blog posts online talking about how to get over failure. However, it seems like no matter how many tips and tricks I read online, that doesn't necessarily make it hurt any less. Over time, I think that I've gotten better at handling failure and I've learned to be okay with it. Yes, it still hurts, but I'm not nearly as devastated as I had been in the past. 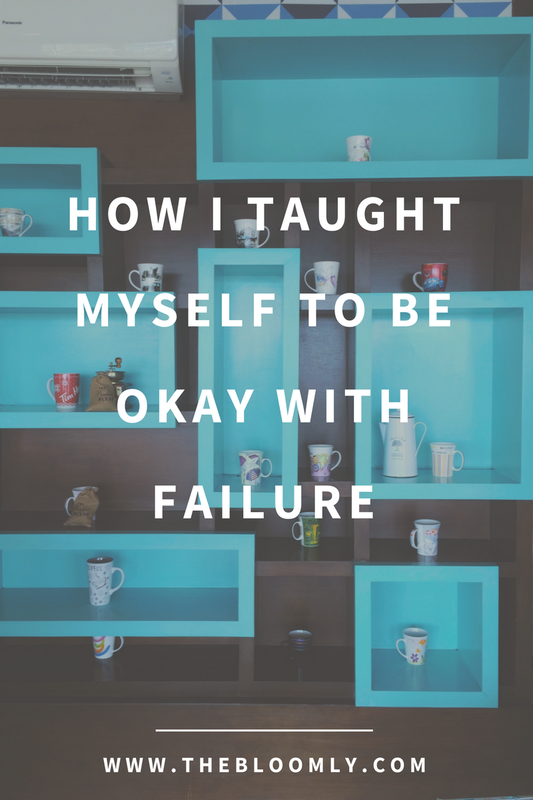 Here are the ways that I've personally found helpful in teaching myself to be okay with failure. I adopted the mantra, "You have a better chance of succeeding if you try compared to the 0% chance if you don't." One thing that I always tell myself when going into something that I'm doubtful that I will succeed in is "You have a better chance of succeeding if you try compared to the 0% chance if you don't." If you go for it, the worst thing that might happen is that you don't succeed. While that can seem scary and immensely disappointing, it's already better than what would happen if you just sat on your hands and never gave it a shot. By not attempting, you're ensuring your own failure. Additionally, you'll always wonder "what if." Go for it, because even if you fail, at least you'll know that you tried your best and have no regrets. I try not to compare myself. In my most recent setback, I was denied an opportunity that I really desperately wanted. However, when I got the news, I wasn't nearly as devastated as I expected I would be. I was content just knowing that I had tried and that I gave it my best shot. Unfortunately, that content faded the second that I started comparing myself to others. I was perfectly okay with the outcome until comparison came into the situation. According to Theodore Roosevelt, "comparison is the thief of joy." Never in had I found those words so true before. What I found was that I wasn't necessarily upset over my own personal failure, but rather I was upset at seeing how my life compared to someone else's, that theirs was a lot more representative of my dream life than my own was. From that experience, I learned that in order to be okay with failure, I needed to focus on myself rather than falling into habits of comparison. I was glad that I went for it and that was all that mattered. One of my go-to immediate reactions after failure is self-loathing. I tell myself that I just wasn't good enough and immediately put the blame on myself. However, I've learned that an important thing when dealing with failure is not to take it personally. Like I mentioned in my post about why one bad day does not define you, there are a million other factors that affect you that are beyond your control. Taking it personally and putting the blame entirely on yourself just puts the whole world on your shoulders. You did what you could and that itself is more than enough. You're not the problem and you don't deserve the blame, so don't put it on yourself. You are not in control of everything and that's okay. I remind myself that failure doesn't have to mean the end. I feel like after every failure it feels like a door is closing. It feels devastating, like it's the end of a dream. However, the thing is that there are other paths to those dreams. If you want to get from destination A to B, yeah, of course you can take the direct path, which might be fastest and the clearest. However, just because there's a road closure there doesn't mean that you can't still detour to get there some other way. Instead of thinking of failure as a door closing, think of it more as a road map. There are so many different pathways, but in the end, you can always find your way to the desired destination. Sometimes you'll have to drive through the snow or in on the rough unpaved terrain or maybe you'll even get a flat tire, but despite those barriers, it's still possible to keep moving. I love this, Rebecca! It is always better to try and to fail than to not try at all. I take failure very harshly but I am too working on how to be okay with it. Pinning this for later! Glad that you liked it, Lauren! Failure is never easy, we just need to learn to get past it!